15 minutes play...BumbleBeans Inc.: roccagal inspired! Here is my inspirational photograph for the architecture challenge. 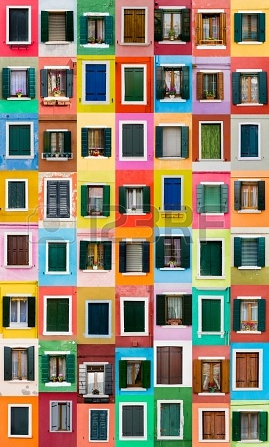 It is a collage of various house windows on the small island of Burano, Italy. Burano is near Venice and the other island Murano (known for the Venetian glass). I loved the houses and could not forget how pretty there were! As soon as I heard the theme of the challenge I knew that I would do something inspired by this island. I found this picture and I love it. It is from 123RF a site that has lots of royalty free stock photos. Great place for inspiration! That's going to be a beautiful quilt. This is so great! What a fun quilt this will be.